Many neurones are extremely invaginated and possess branching processes, axons and dendrites. In general, they are surrounded by a restricted diffusion space. Many of these cells exhibit large, slow potential changes during the passage of current across their membranes. Whenever currents cross membranes separating aqueous solutions, differences in transport numbers of the major permeant ions give rise to local concentration changes of these ions adjacent to the membranes, which will result in various electrical and osmotic effects. 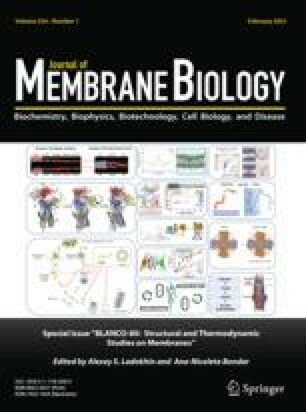 These transport number effects are expected to be enhanced by the presence of membrane invaginations. Dendrites are equivalent to reversed invaginations and there should be significant changes in concentrations of permeant ions within them. In general, the effects of such changes on the electrical response of a cell will be greater when the concentration of a major permeant ion is low. The effects have been modelled in terms of two nondimensional parameters: the invagination transport number parameter β and the relative area occupied by the invaginations δA. If these two parameters are known, the magnitudes and time course of the slow potential changes can immediately be estimated and the time course converted to real time, if the length of the invaginations (l) and ionic diffusion coefficient (D) within them are also known. Both analytical and numerical solutions have been given and predictions compared. It is shown that in the case of large currents and potentials the analytical solution predictions will underestimate the magnitudes and rates of onset of the voltage responses. The relative magnitude of the transport number effect within the invaginations (or dendrites) and other transport number contributions to slow potential changes have also been assessed and order-of-magnitude values of these are estimated for some biological data.